Watching the dawn break from my window signals a shift in the seasons, and also a shift in energy to shorter days and darker nights and mornings. There’s something so emotive about watching this change, which is so apparent during December and January. The mood changes; there is a sense of ending and a beginning in the air, and the nights- at least here in the UK- are considerably colder. Winter also shifts perspective onto physical health. In Ayurveda, I’m a Vata-Kapha type that can get cold easily and suffer from lethargy and tiredness. This is especially more apparent in Winter, so I have been increasing my hot yoga sessions to balance my dosha. I also managed to surprise myself and fight off my annual cold within the first few days by eating seasonally, drinking more water and sipping a liquid tincture of Echinacea. My favourite daily beauty practice is dry brushing before bathing; it really helps to wake my skin up, get rid of dead skin cells and stimulate my lymphatic system. My baths have been extra nourishing, full of Himalayan bath salts, Epsom salts, magnesium flakes, and drops of tea tree and lavender essential oil. For extra indulgence, I have been treating myself to rose petals. Saint Iris Adriatica Every Body Vitality Spritz helps to bring my skin and body to life post-bathing, (and the packaging is gorgeous to boot). There’s something so soul-lifting about using their organic and cruelty-free beauty products. 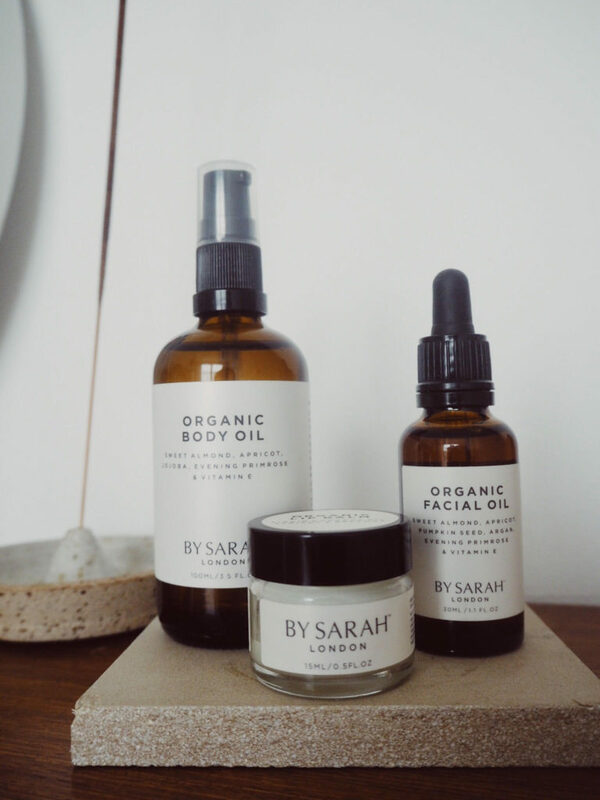 I have then been slathering generous amounts of BY SARAH organic Body Oil over my body which contains sweet almond, apricot, jojoba and evening primrose oil, as well as Vitamin E. I just love how simple but effective this Vegan and organic range is, and how the product ingredients are clearly labelled. I find clean and simple skincare- where I know exactly the benefits of each ingredient- serve me better over complicated and unknown concoctions. Ever since I listened to the Expanded podcast with Living Libations, I have become more aware of my body’s need for more natural products that don’t disrupt the balance of my natural skin microbiome. Evolve skincare has been a huge game-changer for me in this area- they create nourishing and organic-certified products that smell glorious. I have been using their Daily Defence Moisture Mist on my face, and it really helps to lock in the moisture after a shower and keep my skin supple and smooth. Evolve also have their really nourishing and buffing Radiant Glow Organic Face Mask made of a raw cacao, clay and coconut blend. It smells so rich, and lathers up so well leaving my face feeling really refreshed and bright. I passed my Reiki 1 before Christmas, and have been enjoying giving myself attunement which I can already feel is calming my nervous system. Since then, I’ve been giving Reiki to my family and friends, and even my house plants. Soul Medicine’s downloadable music tracks have been a great support for these sessions. Sound therapist Denise Leicester, composer Tom Simenauer and singer Joss Tratt have created sounds to sooth the body, and to awaken the energy of love. On the subject of plants, I bought a new plant that doesn’t require a huge amount of light into my bedroom to bring signs up life. It feels great to have something living and breathing next to my crystals when the sky outside is grey. 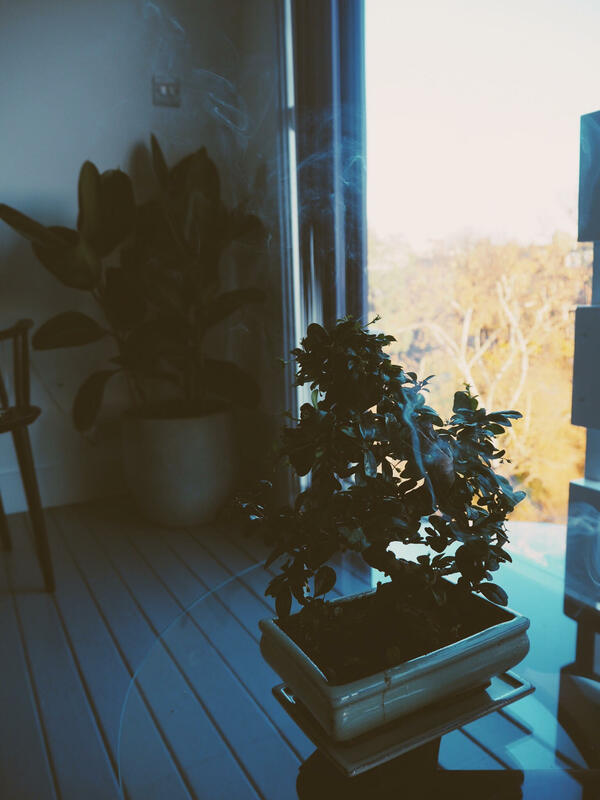 Elsewhere around the house, I am trying to economise my use of white sage and the Native American method of clearing space by instead burning cedar wood which works just as well for me. 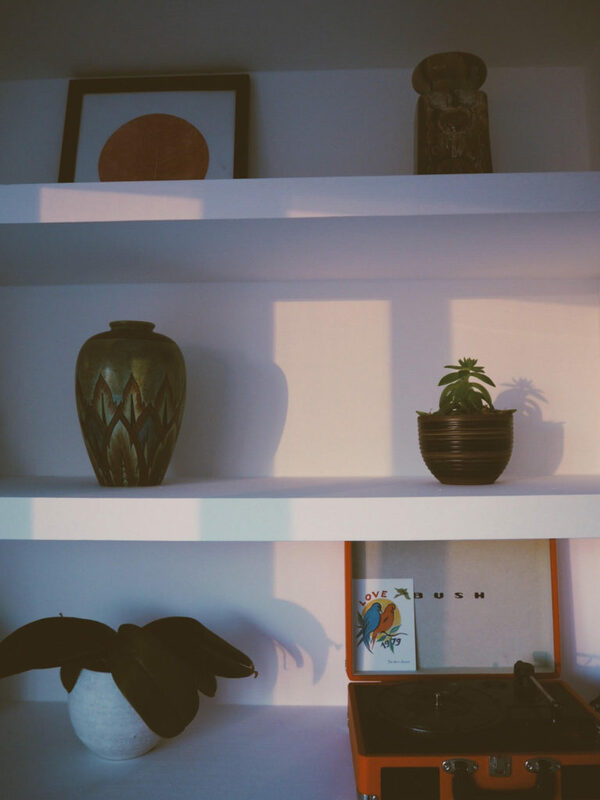 I feel like I’ve truly created a sacred space when I am settled into my blankets and duvet of an evening time, maybe having done a Yin yoga or restorative yoga session, with a cup of cacao next to me. My favourite recipe for Cacao is using powder cacao from Glastonbury-based Indigo Foods who specialist in organic health foods, a quarter teaspoon of turmeric, a small nob of coconut oil, and a pinch of salt and black pepper. I sometimes have trouble going to sleep, so cacao helps regulate my blood circulation in a natural way and I often had powder Reishi for an extra soothing element. I also have been eating a CBD gummy before my bedtime that I found in CBD and You– a shop that has recently popped up in my area. I invite you to indulge in self care this Winter where possible, to turn inward again to find true introspection and give your body the support it needs. You can view more products I’ve been using over the Winter period over in the Black Book section. Also, if you haven’t entered it already then don’t miss this mini self care bundle competition to win a facial jade roller and more. Enter on Instagram here. Full Moon Abundance Giveaway on Higher Self Care! Higher Self Care shares stories from inspiring people around the world and explores spiritual journeys, rituals and the inner world... exploring all that is.